The first snowfall keeps many inside by a warm fireplace. But there are a growing number of cyclists who see a winter commute as another opportunity to be more environmentally friendly – with the chance for bragging rights! 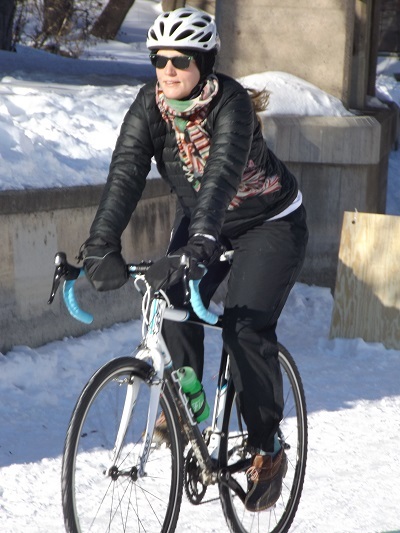 A growing number of cyclists see a winter commute as another opportunity to be more environmentally friendly. For many though, the thought of riding a bike in the winter can be intimidating for many reasons, including freezing temperatures, ice covered paths, and more. But if you prepare properly for the weather, then you may find it quite enjoyable and worth the effort. Plus, you will find plenty of gear options available to keep you warm and safe as you navigate your local winter wonderland. As you ride, you create windchill. So you can make 40-degree day feel like it’s below freezing, leading to an uncomfortable commute. The best solution is to find jackets and pants specifically designed to stop wind. They do that by stopping air from pulling away from your body. A good base layer under a layer that blocks wind can make the winter commute comfortable even in below freezing temperatures. Layering your clothing is important for a winter commute. You know your body better than anyone else, and this means you’ll have a better idea of what parts of your body get cold first, and what follows afterwards. Layer up accordingly for the winter commute. The layer closest to your body should wick away all the perspiration. This is very important. With the cold, if there is any sweat that makes your clothing damp, you’ll get cold faster. Besides layering up clothing to protect your core, make sure that you protect key areas that tend to get cold quickly. For instance, winter full-fingered bike gloves for your otherwise numb fingers, earmuffs for those aching cold ears, nice warm socks for your toes and feet, and perhaps a face mask for when your face feels frozen. 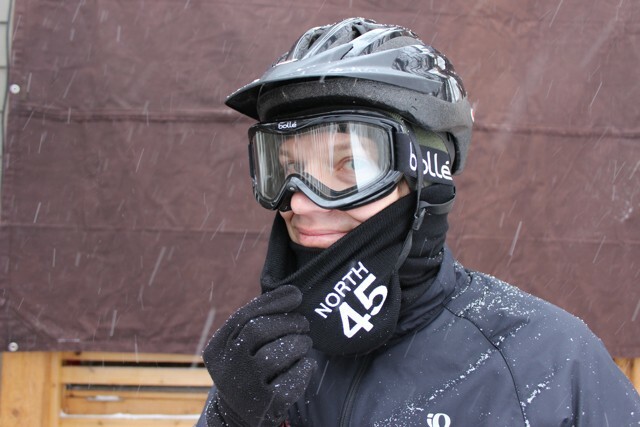 Also, a biking headband or headwear might be important if your head gets cold under the helmet. While a helmet can seem warm in summer, in winter it provides little protection against cold wind. Tip: You should start the winter commute off feeling comfortable, so layer yourself accordingly. Once you start pedaling, you’ll warm up. You can bring an extra layer just in case you need it, but usually you won’t. Have eye protection, like a pair of alpine ski goggles is important for a winter commute. Having clear vision is essential for your winter commute. You need to be able to see and be aware of what’s around you. If you can’t see it increases the risk of unnecessary crashes. Finding proper eye protection is relatively easy and affordable. You can use a cheap ski masks as well as wrap-around sunglasses, if the sun poses an issue. You should also be able to wear standard reading glasses, too, and they may even be able to fit behind your goggles. They may fog up once you get inside, but you’ll be safely off the road by then. The cold winter months bring early sunsets and snow that can make visibility for drivers on the route you define to ride. In addition to wearing reflective clothing, state law requires such things as a white light attached to the front of your bike so drivers can see you from at least 500 feet away (if they are looking at you from the front). There must also be Department of Public Safety-approved red reflector tape or light attached to the back of your bike so drivers can see you from 100 feet to 600 feet (when they are directly behind you). It is also wise to have reflector tape or lights that traffic can see you from side streets and alleys. For information on what the law requires, click here. Since the cold temperatures can shorten the battery life on your lights, make sure you check them often so your lights work when you need them! In terms of the law, if an officer pulls you to the side for not having a front light that meets guidelines (even if it’s there and just not on), there’s no excuse that can help you. If possible, buy a standard bike that’s a single speed. We’d recommend a used or old bike. Bikes with suspension, multiple gears, or that are specialized can get worn down or ruined by the snow, salt, and grit. So getting a bike that you can ride and that can withstand the wear and tear of winter is the best route to go. 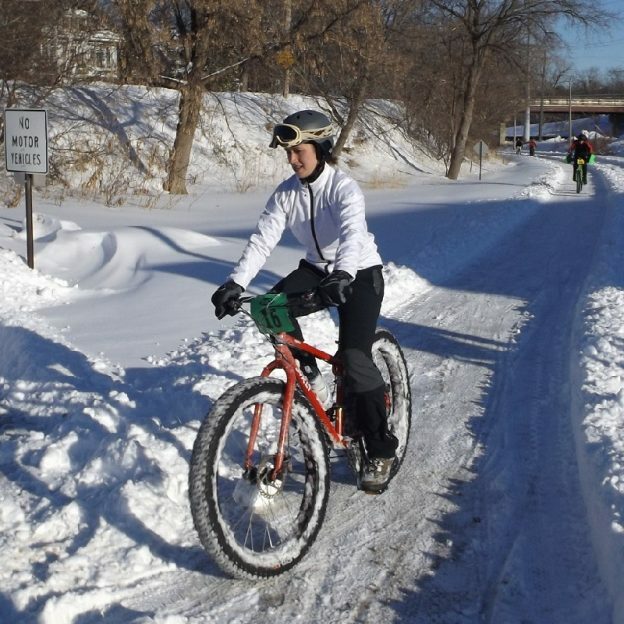 Once you find the enjoyment of riding in the winter, plan to commute longer distances and if its in your budget, a fat bike might be an option to consider. 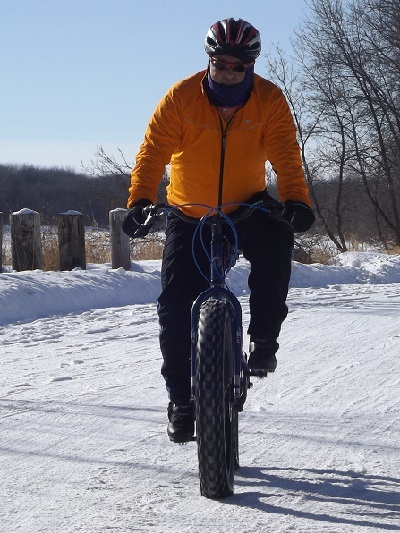 Fat bikes have large balloon tires that increased your surface area, giving you a better grip on the ground under you. This makes riding on snow and ice easier and safer. To learn if a fat bike is for you, visit your local bike shop. When winter commuting by bike you must always be aware of your surroundings even more than warmer months. General visibility may not is an issue whrn winter bike riding, but also watch out for slippery surfaces. Also, drivers can be can be more distracted this time of year so drive your defensively. So even thought they’re supposed to watch for you, make sure you keep an eye out for them as well. Winter means snow, ice, and cold winds. It also means that there is less daylight. Be aware of what options you have if the snow starts coming down heavily, it becomes really icy, or if overall conditions start to worsen. Have an alternate plan in place if biking becomes too dangerous. Plot riding routes that are near bus or train routes or anywhere with public transportation. If conditions get bad then you have another way to get home or to your destination. Also, don’t make any sudden moves or do tricks with your bike, especially in icy conditions. This means don’t lean into the turns, as an example. Going with the turn decreases the amount of contact the tire has with the road or trail surface. This is bad because your bike will have less power to stay upright. This might seem like a no brainer, but we have seen plenty of people who break quickly or make quick turns only to wipe out. Doing this in the middle of the street is dangerous and could become fatal. Winter bike commuting is not only a great way to ride year-round and keep you in shape, but also it can save you money. Looking at cost, in terms of transportation options, biking is definitely on the low end. By the time you add in all the costs that come with driving a car or public transportation, the costs of using anything besides your own legs as an engine will be greater. Plus, you’ll not only be in shape and ready to go in spring, but you’ll also be regarded as awesome for braving that cold air. Have fun, be safe, and remember to use your best judgement this winter while riding! This entry was posted in News and tagged #bikeadventure, #bikingtips, #fatbikes, #nextbikeadventure, #singlespeedbikies, #winterbiking, #winterbikingtips, #wintercommute, bike adventure, face mask, goggles, next bike adventure, wind block, Winter Biking, winter commute on January 27, 2017 by John Brown.